could be yours...could be mine. Yes, I like the sound of that. is offering up her most favorite work as a giveaway...simply go to her blog and post a comment....you will find the details here....Don't walk...run! This is a beautiful, original work of art...I already have a place for it in my abode...you should too! I am feeling overly lucky lately. Pinch me. Buy a lottery ticket. Do both! I recently won the gorgeous Barefoot in Paris book from What's for dinner...and just found out that , also, just won a great Scented oil gift set from Urban Botanical via the Inspired Room. See!! If I can,You can win too. really, really you can, Dorothy. What a bountiful place this imaginary world of blogging truly is. Congratulations on winning those things! That's beautiful, Linda! I'll go right over and leave a comment. Congrats you lucky girl! Hooray! Congrats on all your prizes!! That's great! Ooh, that is a beautiful painting. 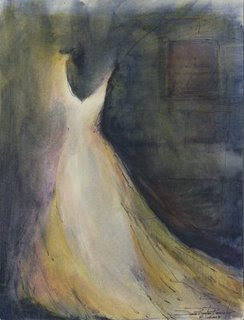 And I like the title "Ghost of a Dress." What a beautiful piece of art! And congratulations you lucky girl. Have a nice weekend. Wow I love your blog..I love the tropics..but I live on coast of Massachusetts..wanta switch!? Ha! Beautiful illustration! Oh my gosh, I am in LOVE with this piece. It has my name written all over it. I'm going over there right now. I spied this gorgeous painting over at PVE. So lovely, isn't it? Hey I've been wanting to be one of your followers but has been putting it up, I thought it would be time-consuming to figure it out how, but now I finally did it. Whew...if I knew it was that easy. I guess its enough to let you know I love your blog. Isn't this painting just magical? I love it! Congrats on winning your wonderful prizes!